If you are planning a holiday party or want to bring the spirit of the season into your outdoor living areas, here are 10 inexpensive, easy outdoor Christmas decorations that will instantly add festive flair. If you are in a rush to create some last-minute centerpieces for an outdoor holiday party, here is a quick option you can make from items you likely already have. For this easy Christmas centerpiece, you can simply gather all of those empty vases you keep in the cupboard and fill them with the leftover ball ornaments that did not fit on your tree. If you do not have vases or ornaments, you can pick up either one of these inexpensively at your nearest dollar store. For the most elegant look, opt for clear, glass vases and fill them with monochromatic ornaments. 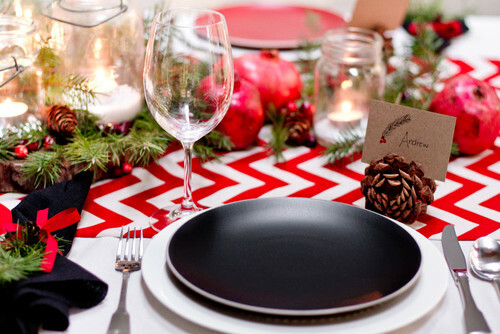 The last step is arranging them in the center of your table while you wait for your guests to arrive. You can find oversized ornaments at craft stores and dollar stores, which makes it easy to stock up on them for some quick holiday decorations. You can simply scatter them in the center of your table as a centerpiece, hang them from your eaves or canopy, or fill colorful flowerpots with them and set them around your patio. You can also line your walkway with them to guide your guests to the party. Cheap, plastic snowflakes are easy to find at dollar stores and mass retailers. You can either leave them as is in their clear or white plastic glory, or you can spray paint them silver or gold for a higher-end look. Once you have acquired your snowflakes and painted them (if desired), hang them around your patio using fishing line or twine, which offers a more rustic look. If you have children, you can make a fun craft project out of painting them and covering them in glitter before hanging them. Craft stores, such as Michaels, now carry burlap in a variety of colors and patterns, which allows you to pick the perfect variety of this versatile material to quickly and inexpensively add some seasonal spirit to your porch or patio. 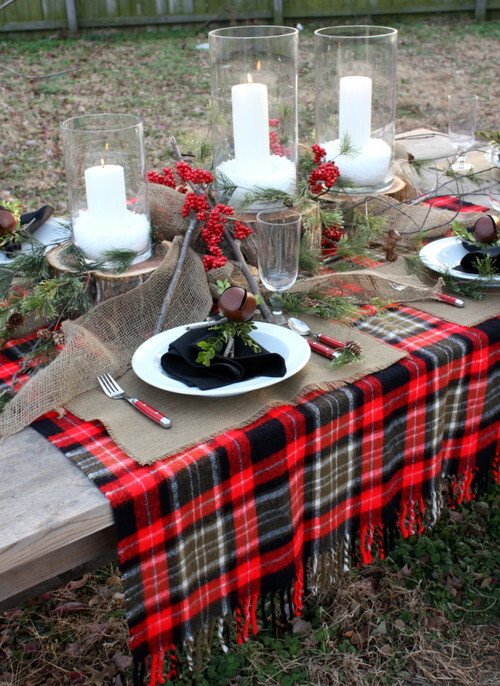 Tie burgundy bows around your outdoor dining room chairs or the planters around the edge of your patio, wrap green burlap garland around the railing on your deck, or cover your tables in red burlap fabric as tablecloths. 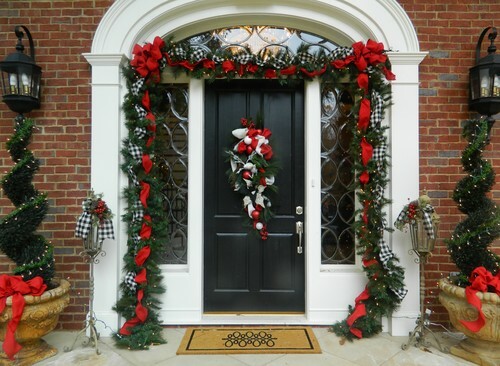 You can even purchase pre-made, burlap bows to make decorating even easier and can use burlap to decorate just about anything, including trees, shrubs and bushes. Many pre-made, decorated wreaths are quite expensive, but you can purchase unadorned wreaths at craft stores or mass retailers for a much more affordable price. Once you have them home, you can decorate them yourself with burlap, pine cones or Christmas ornaments. If you happen to have a hot glue gun, this can be a fun, easy craft project that will allow you to quickly decorate doors, windows or bare walls in preparation for the arrival of your holiday guests. While you are at the dollar store, Target, Walmart or your local craft store, look for pre-made ribbon bows in festive colors or patterns. Match these with wide ribbon and head home to wrap your flowerpots. Simply wrap the wide ribbon around the neck or widest part of the planter, then add a pre-made bow for instant Christmas decorations. Outdoor dinner parties do not generally require seating arrangements, but if you like the idea of organizing who sits next to whom, ornament place cards are a perfect choice that serve double duty as place holders and party favors. You can either purchase fun or elegant ornaments and attach a place card to them, or you can purchase plain ball ornaments and paint or write each guests name on them. Either way, your guests are sure to enjoy taking a personalized or personally chosen ornament home with them after the party. You can sometimes find inexpensive lanterns at dollar stores or discount retailers, but you may have to spend a little more to include these easy outdoor Christmas decorations. 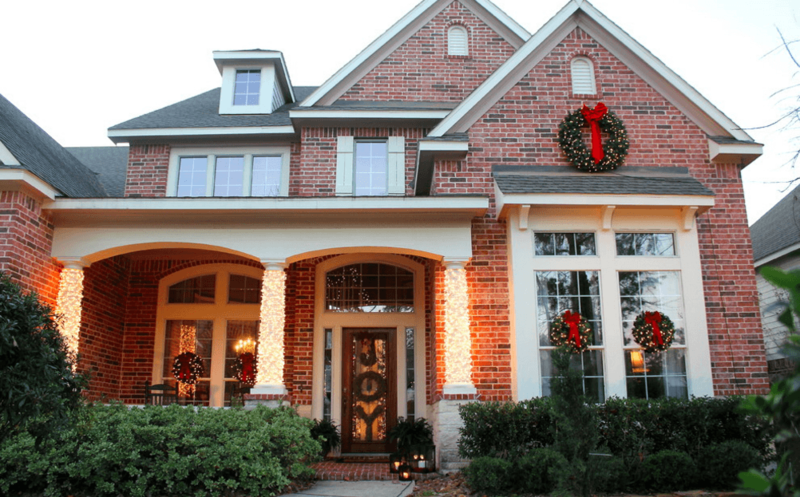 While they may cost more than other options on this list, lanterns immediately add a festive flair to your landscaping and can help provide light in dark corners or along walkways. 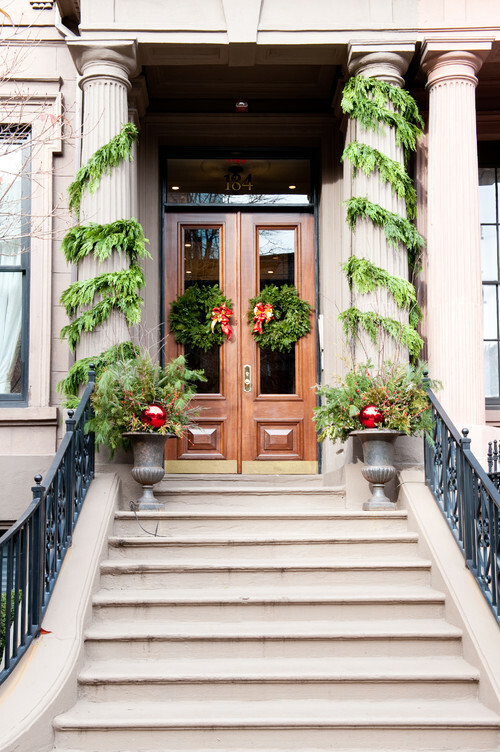 In fact, lining a path with your lanterns or setting one on each stair leading to your porch is a beautiful, welcoming way to greet your guests and lead them inside. Cases of mason jars in various sizes are available at many grocery stores, mass retailers and hardware stores. These hugely popular, versatile vessels are very inexpensive and can be used for everything from drinking glasses to centerpieces. To use them as easy outdoor Christmas decorations, you can fill them with battery-powered lights, transform them into snow globes, fill them with ball ornaments or set them around your patio with red, green, white or burgundy candles inside. Garland is a go-to Christmas decoration that provides an instant option for making almost anything look far more festive. You can opt for a living garland, a faux pine or fir garland, or garlands that are already adorned with lights, pine cones or ornaments. While you can make this a fun craft project, it is easy and affordable to stock up on your preferred style of ready-to-go garland from a nearby craft store. It can then be draped over doorways, trellises, patio fireplace mantels, windowsills and just about anywhere else to instantly increase the visual appeal of your outdoor entertaining area and bring an undeniably festive look to your yard.